Soho, NYC is probably my favorite part of NYC. I love the history of the area, and the fact that there's shopping & food on every corner. I love wearing distressed denim with oversized outerwear for a causal chic look. 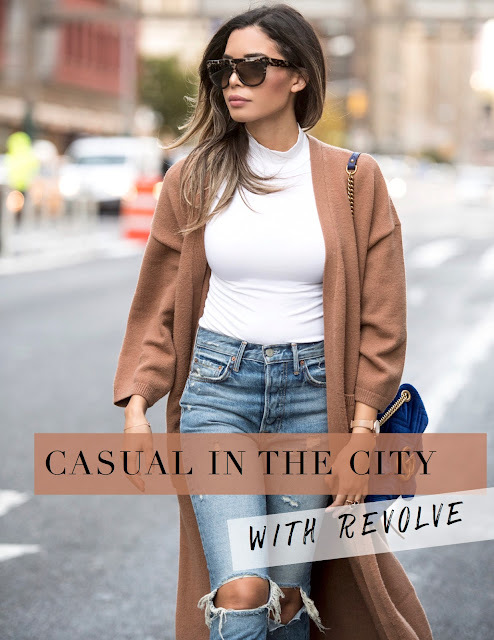 My neutral look is based around my new favorite cardigan by Lovers + Friends from REVOLVE. This cardigan is super cute, goes with everything, and has just the right comfty thickness for a chilly day or night. I paired the cardigan with a white sleeveless turtleneck. Sleeveless turtlenecks are go-to pieces that you can wear on Fall days that start off cold, and get very hot during the afternoon. Wear it underneath your outerwear, to keep your neck warm in the morning. When the afternoon sun hits you, keep cool by taking off your coat, cardigan, jacket, blazer, etc. Shop another great sleeveless turtleneck top that is on sale here. My jeans are by GRLFRND, also from REVOLVE. They seriously make the best jeans! I love a great statement bootie to help make an outfit pop. My white patent Steve Madden booties do just that, and they come in so many other cute colors too!